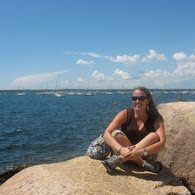 Our very own DEN STAR and geocaching queen, Bridget Belardi was named PAECT Teacher of the Year 2010. She follows in the footsteps of DEN STAR and Glogster queen Traci Blazoski, and DEN STAR Michelle Krill who was 2009 Leader of the Year. Am I surprised that DEN STARS are outstanding teachers–absolutely not. Let’s keep this line of succession going. I am quoting Center Court, the unofficial blog of Mt. Lebanon School Director Josephine Posti. Bridget Belardi, Library Media Specialist at Foster, was awarded the 2010 Teacher of the Year award by the Pennsylvania Association for Educational Communication and Technology (PAECT). She will now be one of the 50 teachers being considered for the International Society of Technology in Education‘s National Teacher of the Year Award in Denver this summer. You can follow Bridget through her blog or on Twitter. Congratulations, Bridget! Here’s Bridget’s nomination information; you can see why she is such a superSTAR. Bridget Belardi is currently the Library Media Specialist at Foster Elementary School in Mt. Lebanon School District. 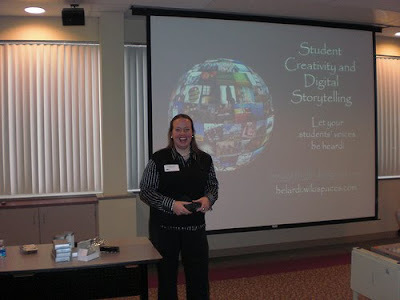 She is a state-level Keystone Technology Integrator, the chair of Pennsylvania School Librarian Association’s Curriculum Committee, and the Events Coordinator for the Discovery Education Leadership Council. As the chair of the Curriculum Committee, Bridget is working on creating a state-wide “suggested” curriculum to include digital resources and lesson plans to encourage all PA librarians to embrace the value of 21st Century Learning. As the Events Coordinator, she hosts events like the American Film Institute and day long technology workshops at Fallingwater for all teachers in Pittsburgh and surrounding areas. She presented at Discovery Headquarters at the 2008 National Teacher’s Institute and the Discovery Leadership Institute and the state librarian association on utilizing GPS units, Geocaching and Google Maps in the classroom. Within her own district, Bridget paired with her Director of Technology to create the first “Administrator 2.0 Academy” during the summer of 2007. They went one-on-one with every administrator to show them a personalized view and set the value of utilizing 2.0 tools in the classroom. Because of those sessions, all schools (including administrators, teachers and students) now have access to the blogs established for discussion, wikis used for collaboration and numerous Web 2.0 tools that were previously blocked and/or not used due to a lack of education on the benefits for students. Bridget and Chris presented this concept at the PA Educational Technology Conference in 2008 and many statewide Intermediate Unit events and continually hear of other schools now reaping the same benefits and increased student achievement. Within the building, Bridget has written grants to acquire 15 GPS units for the school and 35 handheld computers and serves as the web master. She has organized professional development days dubbed “Tech Tuesdays” where teachers come to learn and practice a new tool after school. She also organized lunch clubs for students for filming web shows and podcast shows and/or participate in the Computer Club where students can expand on the ideas learned in class and collaborate and incorporate creativity. She enjoys team-teaching with the classroom teachers to expand the boundaries of student learning. Bridget has been a positive force for the good for years. Ever since we met, she has been collaborative, kind, and patient. She used a lot of the latter when she took me geocaching for the first time two years ago at DENs Leadership Council National Institute. Since then, she was the DEN Events Chair for 2009 and did a wonderful job of growing events throughout Pennsylvania. We are PROUD to call her our own. Google This to find more information about Bridget.